We have all had dreams. Dreams that we would have given anything to achieve and yet have eluded our grasp. It is about reaching for the stars and missing. It is about what one does with the failures that seem to make up most of our lives. And it's about reading this interview I did with a great indie comic book creator called Mathew Ritter. Here. Check it out. Or else you'll be seeing stars. 1) What are your own origins, Matthew? Plus what path did you take in life to get to where you are today? Well, I made a lot of mistakes in my life. I flunked out of several schools. I didn't graduate college. And it wasn't until I was well into my 20's that I randomly decided 'hey, being someone who doesn't try at anything is lame'. At that point I got a job, went back to school, got a degree, done some internships, and got other jobs too. You know. Standard human stuff. Lots of practicing writing, doing it professionally, whenever I could to try and get better at it. 2) How did ‘Nova Phase’ come about? It’s ‘secret origin’ so to speak. 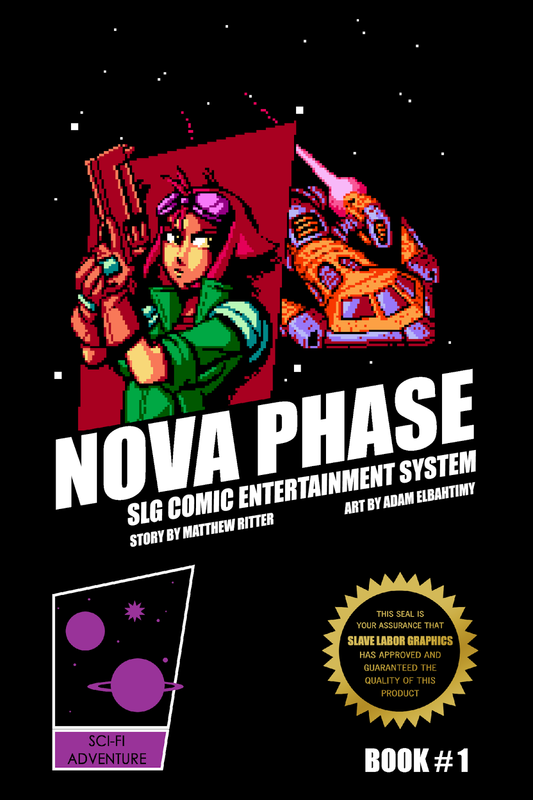 Despite my blog being called '8-bit Space Western', the comic is actually called 'Nova Phase'. You see, when I set-up my blog that name was already taken, so I called it '8-bit' instead. Which came about because I've always had a hobby for pixel art, ever since I used to emulate games on my laptop, take screen shots, and modify the images. I ran into an artist that was much better than me who was into the same thing, and we talked about how we feel pixel art is a valid art form in of itself. Ideas were kicked around, and space western was the one we settled on. The artist is amazing. Adam (his name), blows me and most other humans out of the water as far as pixel art goes. 3) In your own words how would you sum up this tale? It's a story about failure, about how life is little more then a series of failures, and success is the fleeting bits. Also, its about space ships, aliens, cool gunfights, plus a treasure hunt across the galaxy, and the hopefulness of what comes from the unknown. 'Veronica Darkwater is a down on her luck bounty hunter who finds herself plunged into an intergalactic treasure hunt for a legendary world of untold wealth. But she must compete with a crazy military commander who will stop at nothing to cement his name in history. Will she stay alive long enough to see if the legends of the mythical world of Una Tesara are true? A riveting adventure with retro 80's/90's arcade style art'. 4) If you could get a celebrity – either living or dead – to promote your wares, who would you choose, and why would you want to choose this particular person? Jesus. I think if he really liked my comic and was vocal about it that would be a big boon. 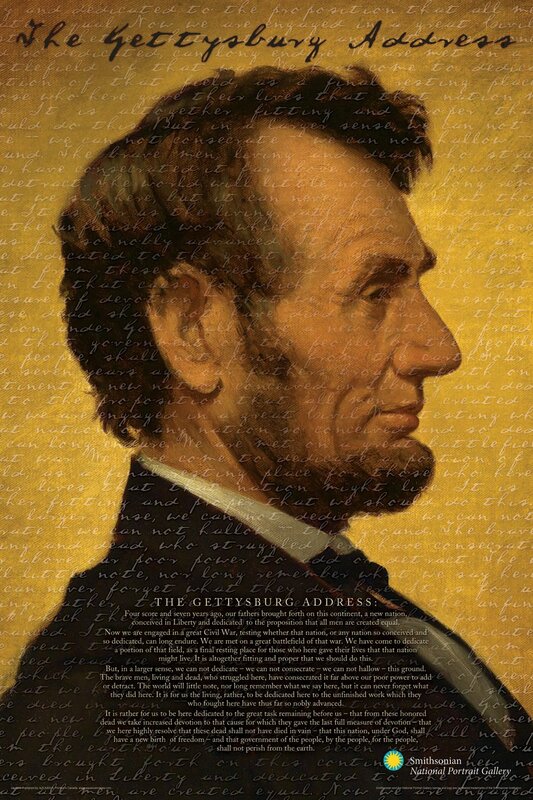 Or maybe Abraham Lincoln. Same deal. 5) What song would you say best represents your story and why? Probably these two songs. They were made especially for the comic, and I think they sum it up really well. I love bit tunes, and these are damn fine ones. Even if they weren't made with my comic in mind I'd still think that. Maybe, I can't go back in time and change the context of my listening though. 6) What artists / writers have you admired the most? I admire so many creators, and it changes day to day, sometimes hour to hour. So that's such a hard question to answer unless I'm going to write a six page essay of names and works, so I won't. Saying that, though, I'll go with one name -- Roger II of Sicily -- who is probably my favorite commissioner of mosaic artist of the moment, which is of course basically the same art style as pixel art. I just really like the stuff he commissioned. He didn't make it himself, and sometimes it can be hard to say who the actual artists was. Like a lot of early video game art! 7) What have you learnt about yourself through this endeavour? And were their any unforeseen obstacles you had to contend with along the way? 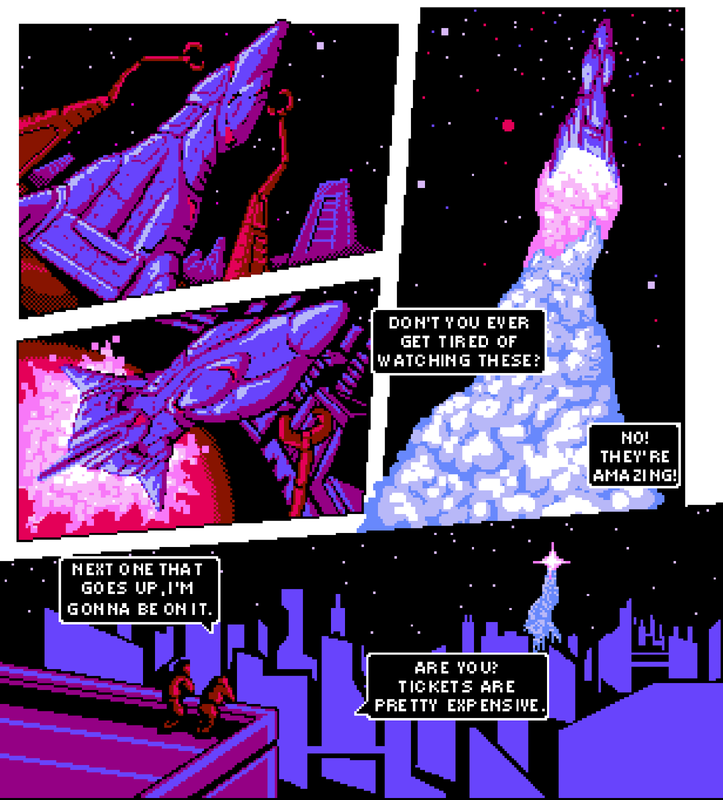 For a long time it didn't look like anyone cared enough to publish a pixel art comic. I went through a lot of rejections. Also, it isn't like this pays the bills, this is mostly a labor of love. About myself? I found out that I am willing to make comics no matter what, and will. It's what I just really like doing, and I won't ever stop. 8) During your time in this field, what is the one thing that has kept you in good stead? The answer is pretty mean, but bad comics. There's LOTS of good comics out there if you know where to look, but when you go read a bunch of random comics, odds are you're going to read some of the worst stories you've ever seen. (the same could be said of many fields). Knowing that the stuff I write is better than a lot of the sludge out there always helps me think I might be able to find an audience. I could always be wrong of course, and find out that I've made the worst comic of all time. That'd be cool too. Being the worst at something is its own sort of greatness. 9) If you’re comic had a motto, what would it be? 'Point yourself at any horizon you can'. So there you have it, folks, 'Nova Phase' and my mate Mathew in a can. 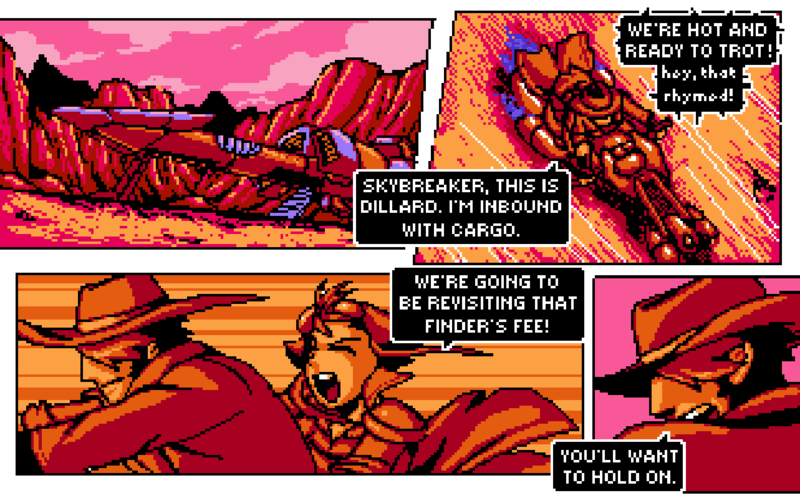 When you have the time please check out 8-Bit Space Western and his Facebook Page. Trust me. One click, and you'll be going to bits. 8 Bits of course.